On May 21, 2011 some people in various parts of the world waited with bated breath for the coming of Christ to take them to heaven. They had believed the prediction of a man from California, named, Harold Camping. But to their dismay, May 21, 2011 came and went just like any other day. No doubt, there were regrets, tears, anger, confusion just to mention but a few. History is full of stories of people who predicted the end that never was. Most of these people, if not all of them claimed to be Christians and they used Scripture to make their predictions. A latest episode is the one of May 21, 2011. 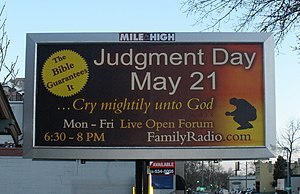 Harold Camping fooled some people into believing that rapture will occur on May 21, 2011 and the complete end of the world will be on October 21, 2011. I don’t have to remind you that both prophecies proved to be a fallacy. Predicting the Day of Judgment has very serious theological implications. While some might regard it as an element of Christianity, the truth is that prophesying the actual day that the world will end is anti-Christian. This fact is seen when one puts on their biblical and theological lenses and look at the whole issue critically. The first implication is that if one predicts the end of the world he makes God to be a liar. God has said in his word, “But concerning that day and hour no one knows, not even the angels of heaven, nor the Son, but the Father only…Therefore, stay awake, for you do not know what day your Lord is coming…Therefore, you also must be ready, for the Son of Man is coming at an hour you do not expect” (Matthew 24:36, 42, 44). Now if God can lie concerning the Day of Judgment, should we trust him in other areas? Should we trust his word when he says “Believe in the Lord, Jesus Christ and you will be saved”? (Acts 16:31). If God can lie about the Day of Judgment can we take him at his word when he says, “If we confess our sins, He is faithful and just to forgive us our sins and cleanse us from all unrighteousness”? (1 John 1:9). This is the difficult situation in which all those who claim to know the Day of Judgment find themselves in. They imply that God is a liar and should not be fully trusted. Again, here we need to ask: if God can change like this, can we really trust him? In Acts 4:12, God says that there is only one name by which we must be saved and that name is Jesus Christ. If God changes, how can we be sure that tomorrow he won’t change and give us another name by which we must be saved? It should be Christ and the power of his cross that should lead people to salvation and not the wisdom of calculating years to arrive at a date that the world will end. Apostle Paul knew very well about the futility of wisdom compared to the power of the cross. That is why he challenged the Corinthians who loved knowledge and wisdom and said: “When I came to you, brothers, did not come proclaiming to you the testimony of God with lofty speech or wisdom. For I decided to know nothing among you except Jesus Christ and him crucified” (1 Corinthians 2:1, 2). Lastly, predicting the end and claiming that it will lead to salvation of many souls in unbiblical. Salvation is by grace not by fear. It was “Amazing grace…that saved a wretch like me” and not the amazing fear of the end of the world. Moreover, fear can never truly save anybody. It is God who saves and nothing else. No matter what tricks we can come up with, they can never truly save. They will only produce fake and false conversions. “For it is by grace you have been saved and this is the gift (or the work) of God” (Ephesians 2:8) (italics added). These are some of very serious theological implications that come along with predicting the day and the hour that the Lord is coming. So, for me, instead of regarding the prophets who predict the “doomsday” as working for the good of Christianity, I see them as doing otherwise. It is not my intention to judge or question their Christianity. Only God can judge them. Nevertheless, one thing I know for sure is that predicting Judgment Day is anti-Christian hence I don’t doubt that it grieves Christ. Postscript:Following his failed predictions, Harold Camping together with his Family Radio Station have repented of their sin. I thank God for this and I believe that Camping’s repentance is sincere and that Christ has forgiven him. Below is a letter of his confession and repentance which was posted on the website of Family Radio but I got it from the website of Christian Post. How true! Your article is very clear and I only hope more people read it and take it seriously. More than that, mass media love to portray Christians out as doomsday idiots – let’s not give them more fodder! Have a nice day! So in regard to judgement day, the revealed Word of God clearly says that no one knows the hour and the day except God himself. Have a blessed day as well. Wonderfully written! And I certainly hope that Camping and his staff truly uphold themselves in a better light after issuing their apology. This is not the first time he’s been wrong (and, yes, it’s accepted because we are human after-all) but he can change. We’re both Faithful Bloggers so I wanted to stop by and share the love. I’d love to guest feature on your blog someday! Thanks for your comment. You are welcome to guest feature on my blog anytime. Excellent article. I’m amazed when people start “predicting” or trying to figure out when Christ will return. Thanks Byron for your comment. Indeed, it’s amazing how somebody can be bold enough to declare the day of Christ’s return while Scripture clearly says that no one else except God knows the day.